Milk chocolates with a soft toffee centre (45%). Good to remember: Enjoying chocolate as part of a varied, balanced diet and a healthy lifestyle, is one of life's little pleasures. ROLO is part of the Nestle Cocoa Plan, which works with UTZ to ensure a better future for cocoa farmers and even better chocolate for you. Find out more at www.nestlecocoaplan.com. A multipack of 4 tubes of delicious ROLO®, milk chocolates with a soft toffee centre. 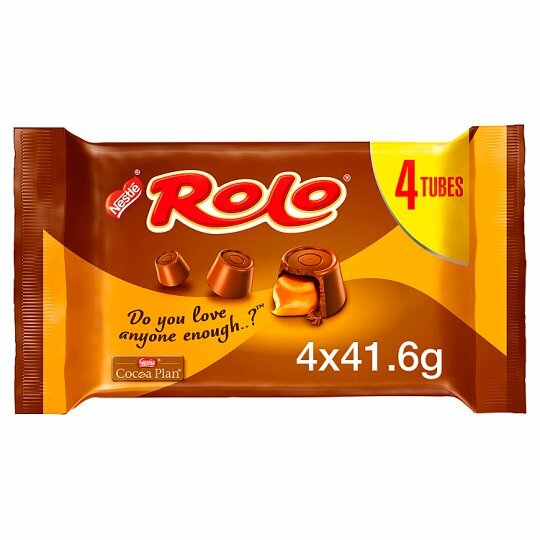 ROLO® 4 tube multipack ensures you can always have your favourite treat on hand. ROLO® was developed in England by Mackintosh's and were launched into the UK market in 1937 in its iconic tube. The ROLO® sweet is a simply delicious combination of sweet, buttery, smooth, soft golden toffee encased in a milk chocolate cup. Each ROLO® tube is made from paper and aluminium foil, which can be easily recycled in the UK. Initially produced at the Mackintosh factory in Norwich, in 1994 production was transferred to Nestle's Fawdon factory in Newcastle, UK, where they still continue to be made to this day in their billions! ROLO® is most famously recalled for its strapline "Do you love anyone enough to give them your last ROLO®?" which has been used in the UK since 1980. ROLO® does not contain any artificial colours, flavour or preservatives. 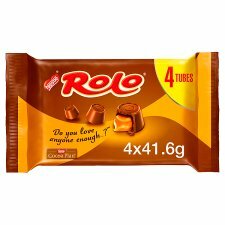 In the UK market consumers can enjoy ROLO® in 52g tube, 126g sharing bag and 280g minis packs, all of which can be found in retailers all year around. Additionally you can also enjoy ROLO® though a range of seasonal gifts including Easter Eggs and Christmas giant tube. 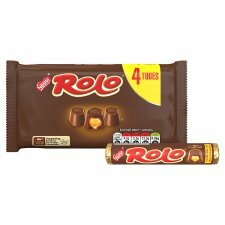 Why not try the ROLO® Sharing Bag 126g!